Looking for an adventure in one of the world's great megacities, but without the hassle of flying halfway around the world? Mexico City is North America's largest, at over 8 million people (and more than twice that number in the greater metro area). It's the oldest capital city in the Americas, rich in history and culture, and a major economic center in the region today. In addition to Aztec ruins, the city has the world's largest single-metropolitan concentration of museums, plus extensive art galleries, concert halls and theaters. And the city's 16 boroughs and many colorful neighborhoods offer an abundance of shopping, restaurants, bars and nightlife. Whether you're trying to escape ASAP or you're looking to plan ahead based on the cheapest fares, take a look at these forthcoming flights between New York City and Mexico City, which we pulled from travel site Skyscanner. We've also included popular hotels, restaurants and attractions in Mexico City to get you excited about your next excursion. Currently, the cheapest flights between New York City and Mexico City are if you leave on April 6 and return from Mexico on April 9. Interjet currently has roundtrip tickets for $166. There are also deals to be had in March. If you fly out of New York City on March 27 and return from Mexico City on April 3, United Airlines can get you there and back for $190 roundtrip. To plan your stay, here are some of Mexico City's top-rated hotels, that we selected from Skyscanner's listings based on price and customer satisfaction. For an all-around top recommendation, consider The St. Regis Mexico City. The hotel has a five-star rating on Skyscanner, and rooms are currently available for $255. "Great location to amazing restaurants and street food, excellent staff, champagne to greet you when you walk in, daily free dessert delivery -- what else can you ask for on a vacation?" wrote visitor Yvette. If you're looking to treat yourself, consider The Four Seasons Mexico City. The hotel has a 4.9-star rating on Skyscanner, and rooms are currently available for $179. Set in the heart of Mexico City on the busy Paseo de la Reforma, this luxury hotel is close to the Monumento a los Ninos Heroes and the Monumento a los Heroes de la Independencia. Another pricey alternative is The Condesa DF. The 4.6-star hotel has rooms for $265/night. This 40-room luxury hotel is located in Mexico City's Condesa district, close to many restaurants, bars and cafes. Don't miss Mexico City's food scene, with plenty of popular spots to get your fill of local cuisine. Here are two of the top-rated eateries from Skyscanner's listings. If you're looking for a local favorite, head to Panaderia Rosetta, which has an average of 4.9 stars out of 11 reviews on Skyscanner. "It's a very cozy breakfast spot with only a few bar stools for seating. Get there early to get your hands on the good pastries," wrote visitor Leila. Also worth considering is Casa de los Azulejos, with 4.7 stars from 14 reviews. "It's set on one of the main tourist streets in Mexico City. Many people stop by to get a picture of the unique facade or to grab a coffee inside," wrote Gianfi. Mexico City is also full of sites to visit and explore. Here are two popular attractions to round out your trip, again from Skyscanner's listings. The Palacio de Bellas Artes, with 4.8 stars out of 74 reviews, is another popular attraction. 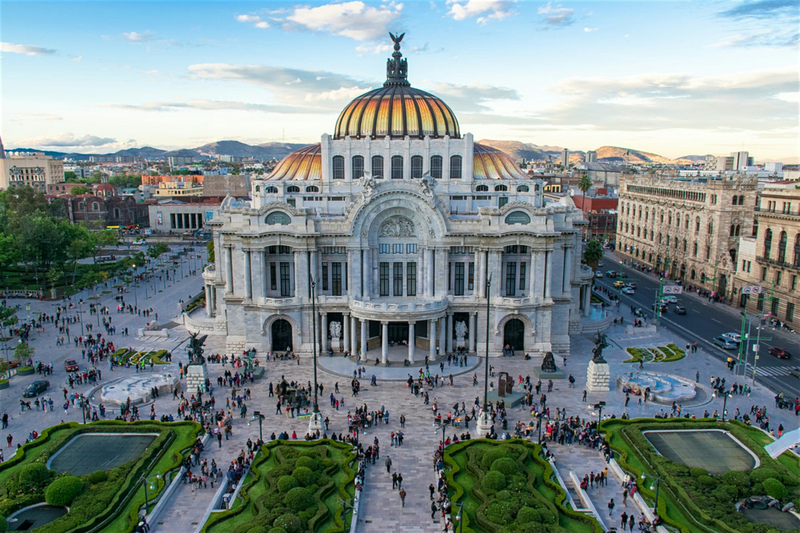 Inaugurated in 1934, the Palacio de Bellas Artes in Mexico City is a major cultural center where you can attend poetry readings, operas, dance recitals, art shows and more. Inside, find spectacular murals by renowned artists, such as Rufino Tamayo and Diego Rivera. "The place is a beauty," wrote visitor Analu. Next, spend some time at Callejon Regina. It has five stars from five reviews on Skyscanner. "Undoubtedly, this is one of my favorite areas of the historic center. It's the home of very trendy cafes and restaurants as well as the refuge of urban and independent artists," wrote visitor Rebeca. This story was created automatically using flight, hotel, and local attractions data, then reviewed by an editor. Click here for more about what we're doing. Got thoughts? Go here to share your feedback.